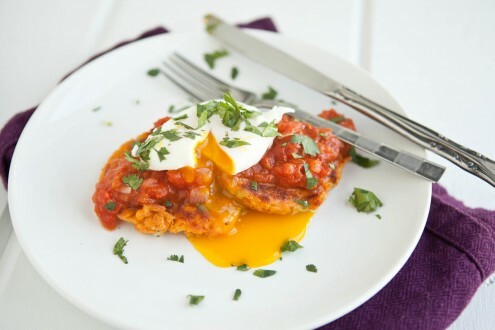 Sweet Potato Cakes with Curried Tomato Sauce and Poached Egg | Naturally. There are moments in life that create feelings and emotions that are often difficult to express into words. It’s driving down a back country road with my windows down and the cool, crisp night air whipping my hair around. My music at almost deafening levels which might be a problem if I wasn’t singing just as loud. The stars seeming extra bright because the glow of the city is behind me. Or it’s just washing my sheets and realizing I’ve got nothing to do for the rest of the day so a nap is a perfectly acceptable (and logical) progression in my day. The best is when the sun is just barely peaking in and the spring breeze is drifting through the open windows. Or it’s taking a bite of a dish that I wasn’t sure would turn out only to find it’s possibly one of the best things I’ve ever made. Realizing, yet again, that experimenting in the kitchen (and not being 100% sure) is okay. This week for The Food Matters project was originally labeled “Curried Tomato Soup with Hard-Boiled Eggs.” I really hate basing a meal on tomatoes when all I have is canned (and tomato season is still a couple months away.) When I read in the instructions that this originally was a sauce, I started leaning in that direction but it was secured when Sara posted these fantastic looking sweet potato cakes. Don’t be afraid by the list of ingredients here. Most everything I had in my house and assembly was rather quick. It’s a great leisurely breakfast for the weekend or a light dinner for the week day. The original recipe can be found on Joanne’s blog this week and as always, for everyone’s version, head over to The Food Matters Project website! In a small sauce pan, heat olive oil over medium-low heat. Add onion, garlic, and ginger. Cook for 2-3 minutes and add in curry powder (I use a high quality Thai Curry powder or make my own.) Let cook for another minute. Peel sweet potato and cut into rough 1/2″ cubes. Steam until sweet potatoes have softened . Mash sweet potatoes and set aside. In a skillet, heat olive oil over medium heat. Add green onions and garlic, sautéing until fragrant, 2-3 minutes. Combine sweet potatoes, onions, soy sauce, salt, egg white, and flour. Batter will still be sticky but should hold together. Heat a pan over medium heat and a a touch of oil (I used stainless steel and had to use about two tablespoons of oil. Scoop out two tablespoons of sweet potato and place it in pan, smashing into a 1/2″ thick circle. Cook on eat side until golden brown, 6-8 minutes. Remove from pan and place on a paper towel to drain. During all of this, fry or poach an egg. This resembles the closest way I poach an egg. To assemble, lay sweet potato cakes, followed by tomato sauce, egg, and cilantro to garnish. *The sweet potato batter can be mixed and store overnight as well. I LOVE this! Those “cakes” sound delightful and with that sauce?! Yum! 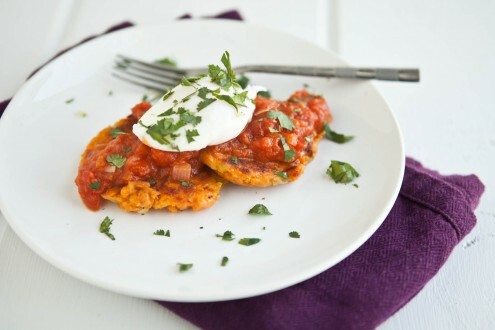 These sweet potato cakes are the perfect accompaniment to Bittman’s sauce! i definitely love what you did with the recipe! 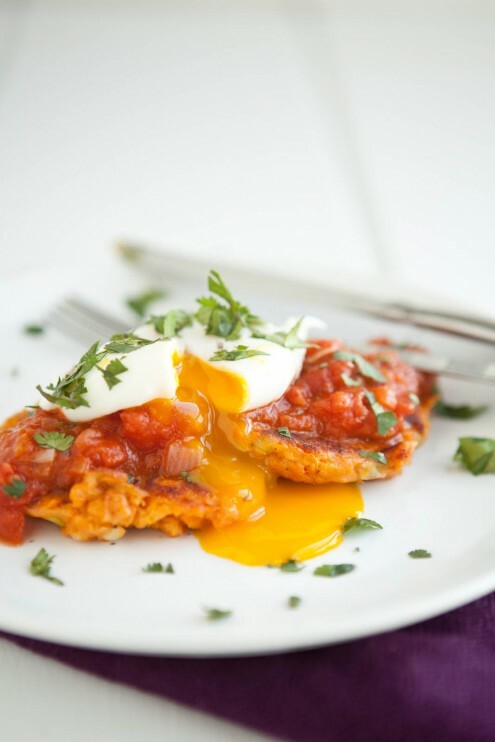 I love sweet potato cakes and with the egg and sauce, it has to be out of this world delicious. Love your variation of this week’s recipe! Sweet potato cakes are my favorite and Sara’s recipe sounds great! All I can say is, I love everything about this recipe… This weekend, I made sweet potato pancakes with chocolate chips and it was so good. I can only imagine a savory sweet potato cake that can be an entire meal in itself. Just delicious! Love your variation, it sounds fantastic. Ha, too funny! We totally did create something pretty similar! So love your version using the sweet potato cakes! I keep scheming up ways to eat the cakes- so many combinations! Glad I can be of inspiration! I think you will love it too! Oh, yum! I love what you did with the recipe! These weren’t flavors that I was very familiar with, so I stuck close to the original recipe. Now that I know how good the curry/tomato combo is, it would definitely be delicious with sweet potatoes! This looks great Erin! I love how you used the ingredients. I also couldn’t bear to make a soup out of canned tomatoes so I did a Curry Fried Rice. Your pictures are beautiful! This sounds like a really tasty meal! Experimenting in the kitchen is the greatest–it’s so satisfying. 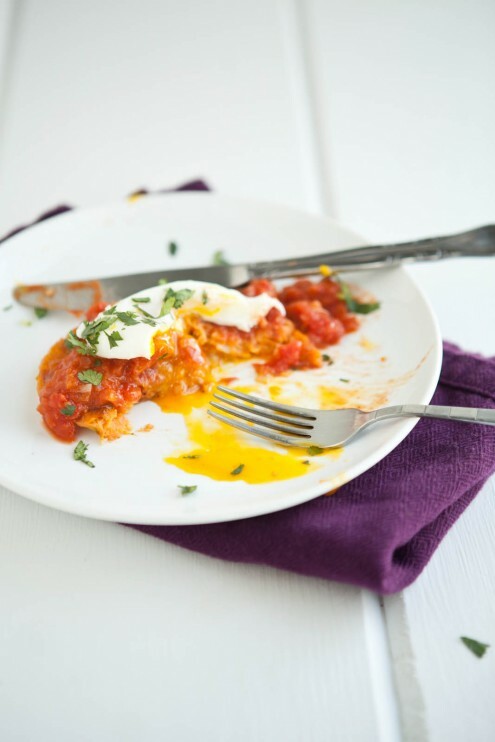 And I have to say that beautiful egg yolk looks so good with spicy tomato and sweet potato! I never would have thought to combine Sara’s sweet potato cakes with the curry! And that poached egg on top looks great. Wonderful pictures! Looks so yummy? I just made this. Oh my god. It is was amazing. Wow. Just made and enjoyed this delicious meal! It will definitely find it’s way to our kitchen again in the near future 🙂 Thanks for sharing. This was very tasty! The sweet potato cakes were a little tricky for me to get firm enough to flip but that was probably something I missed. All in all my one year old and I truly enjoyed it! Thank you for the recipe!